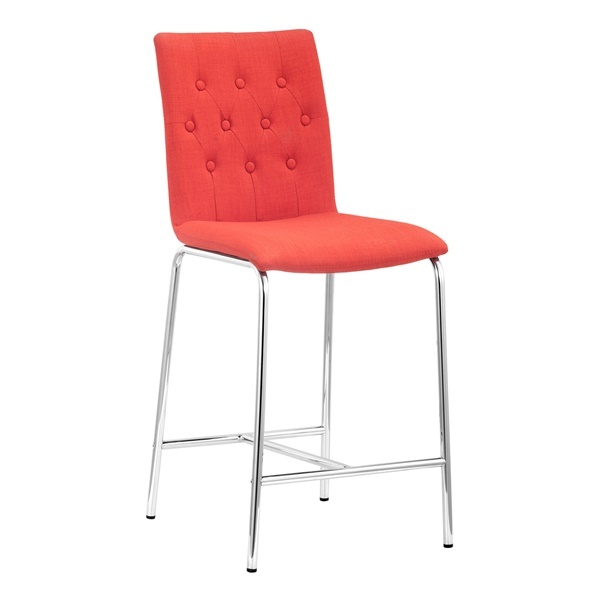 Available in multiple eye-catching colors, the Uppsala Counter Chair from Zuo Modern is sure to stand out in any modern or retro setting. This top-notch chair Includes light button tufting that gives the piece an upscale look and feel. Also, the chair boasts a cozy polyblend seat and back, along with a classic chrome frame that provides amazing support. Pick up a counter chair that blends form and function beautifully with the Uppsala Counter Chair. Available in a wide variety of stunning colors. Includes light button tufting that gives the chair an upscale look and feel. Boasts a classic chrome frame that provides amazing support. Polyblend seat and back deliver supreme comfort day after day. What is the height from the seat to the floor of this item? Is 39�€™ from the floor to the top of the back? The seat height is 24", and the overall height is 39".